Until recently some important family matters had kept me away from the delights of the Conroe theatre scene for over a year. What a pleasure to discover, upon my return, that sold-out houses for that same theatre scene were becoming more and more common. 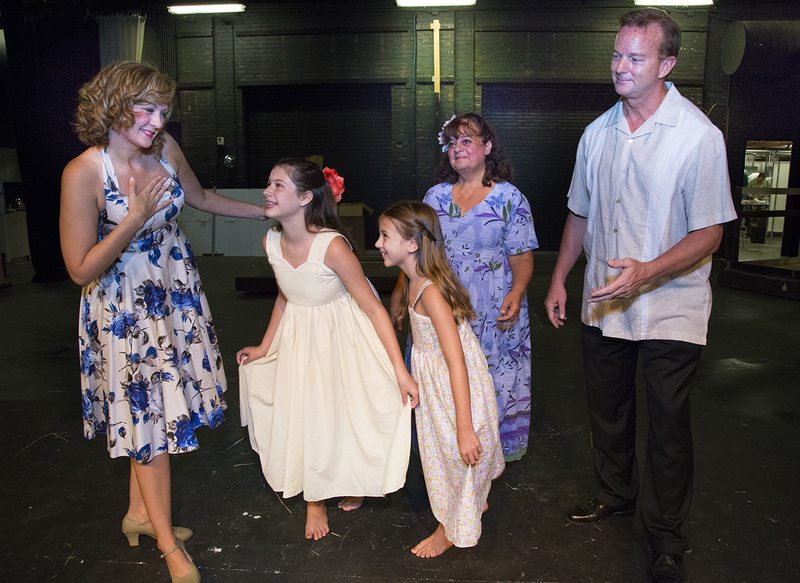 Such was the case this past Sunday when I discovered the Players Theatre Company’s production of Rodgers and Hammerstein’s SOUTH PACIFIC was, indeed, Sold Out at the Owen Theatre! As luck would have it, a charming local actress, Martha Davis, was in the audience for that performance and had kindly turned in an unused ticket, as her husband was unable to join her. While my own guests were seated on the other side of the room, that extra ticket happily came to me and assured me of a great seat for a great show that clearly deserves its sell-out status. Director, Marty Craig, has much to be proud of. Before the curtain rises, Musical Director, Dave Englert, led his wonderful 24-member orchestra in the lilting and lovely Overture. Many in the audience were unaware that the musicians were sequestered in the rehearsal room behind the audience, with their live music skillfully piped into the auditorium by sound designer, Becky Teague. The lovely tropical set (designer, Ron Craig) nicely captures the lush South Pacific region and the volcanic Bali Ha’i Island in the distance across the water. The action begins on a beautiful patio of the plantation owner, Emile DeBecque (Gale Tynefield). It was sheer perfection, and was then followed by the warm intimacy of her “Twin Soliloquies” duet with Emile. As the pair gets to know one another, Tynefield’s solid baritone voice brings us the fine, “Some Enchanted Evening,” from Emile. A simple and rapid set change brings us to the beach where the naval Seabees are being hustled by shrewd Bloody Mary (Brandi Baldwin) who is hawking such assorted tourist souvenirs as grass skirts and shrunken heads. Baldwin brings a whole new level of rousing fun to the production with her zany characterization. The Seabees sing her praises in a lusty, “Bloody Mary” that is full of merriment highlighted by cute, acrobatic, and lumbering choreography from the sailors. (Choreographer, Jody Schrier). The fun continues to escalate as the Seabees’ self-appointed leader, Luther Billis (Mike Ragan), leads the men in another lusty number, “There Is Nothing Like a Dame.” The men all hope to visit the mysterious island across the water, and as Bloody Mary sings of its enchantment in “Bali Ha’i,” she weaves a magic spell (Lighting Designs, Roger Ormiston), and we are treated to the full-voiced power of Ms. Baldwin. A new young officer named Lt. Joseph Cable (Creg Kelly) has arrived. World War II is in progress, and the base commanders (Rick Sellers as Capt. Brackett and Steve Murphree as Cmdr. Harbison) have important military decisions to make. Meanwhile, Nellie has learned that Emile killed a man before leaving his homeland of France, and she sings of how, “I’m Gonna Wash That Man Right Outa My Hair.” It is a delightful number with the nurses joining her for pleasant song and dance as they do again a short time later during the radiant joy of, “A Wonderful Guy.” Whether with swimsuits or evening gowns, the costumes for the gals (designer Lynn Peverill) are quite lovely, and formal wear for the gents was sharp as well. Before he is sent off on a risky mission with Emile, a romantic subplot surrounds Lt. Cable when he meets beautiful Liat (lovely Alexandra Casey), the daughter of Bloody Mary. Liat’s charming costumes were another pair of winners from Ms. Peverill. Following Intermission the audience was audibly abuzz with delight. The opening of Act II seemed at first to lack a bit of focus, but that was quickly resolved as a beaming Bloody Mary delivered a solid, “Happy Talk,” that featured some graceful dancing from Liat in an Oriental costume of elegant black silk with colorful flowered decoration. With a good-humored introduction from Capt. Brackett (Mr. 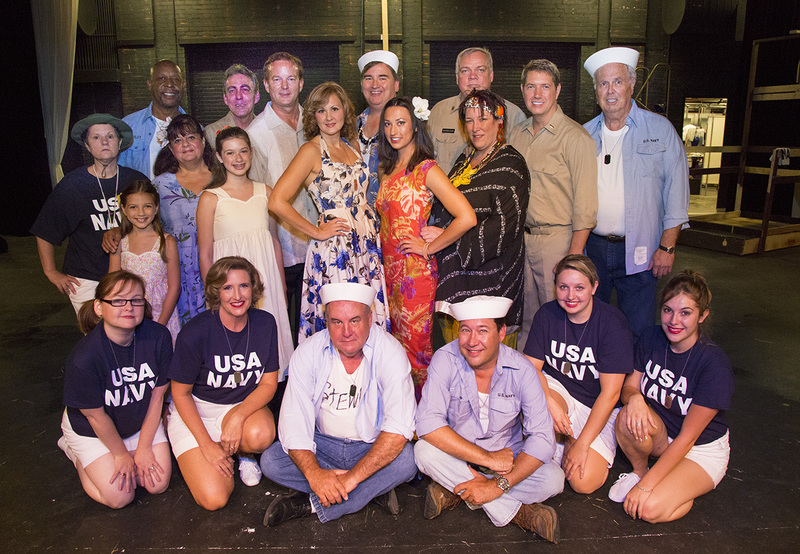 Sellers reminded me a bit of actor, Jason Robards), a comic highlight of the production explodes with joy as the Seabees and Nurses put on a riotous Thanksgiving show. It stars Nellie, merrily cross-dressing as a sailor, while Luther pairs with her hilariously while costumed as a buxom hoochie coochie dancer in a grass skirt. L-R: Capt. 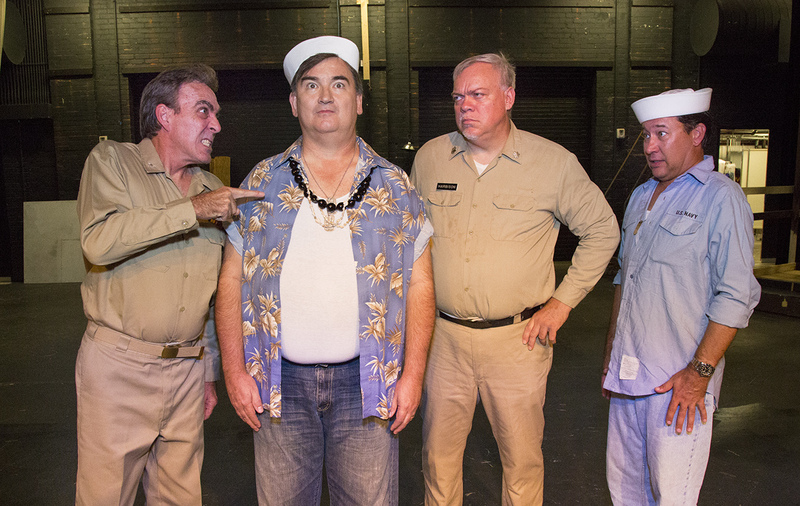 Brackett (Rick Sellers) gives Luther (Mike Ragan) a tongue lashing, while Cmdr. Harbison (Steve Murphree) and a fellow Seabee look on. With talented Mr. Ragan leading the uproarious charge, the guys and gals in the chorus (Vocal Direction, Angela Rivera) really had fun singing and dancing for this fun-filled, “Honey Bun” number. The audience roared its approval. 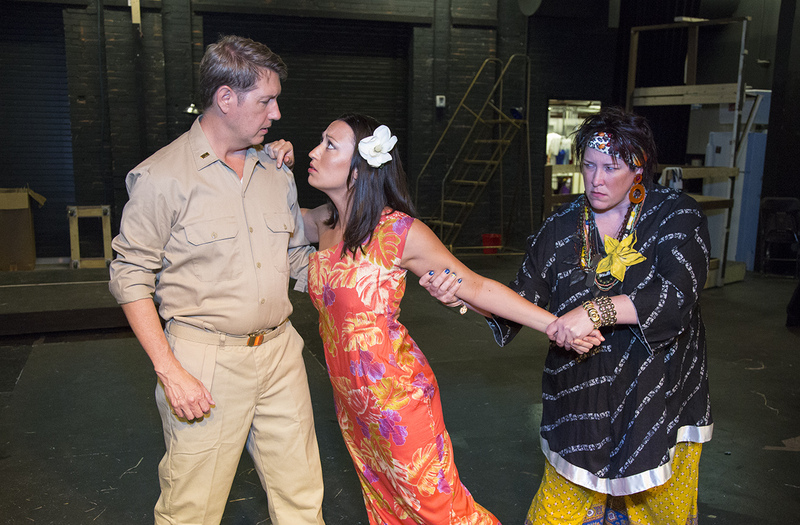 While last Sunday’s matinee was, in fact, Sold Out, South Pacific continues at Conroe’s Owen Theatre with performances this Friday and Saturday at 8 pm. To seek remaining tickets and information call 936 539-4090 or visit the website at www.OwenTheatre.com. This entry was posted in Broadway, BroadwayStars.com, HERE HOUSTON-Lifestyle & Entertainment, Houston Community Newspapers online, Rodgers & Hammerstein, South Pacific, The Courier Columns, Theater Reviews, ThePeoplesCritic.com, YourHoustonNews.com and tagged Broadway, musicals, Owen Theatre, The PLAYERS Theatre Company. Bookmark the permalink.